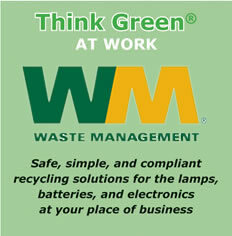 The Services (as defined herein) are provided by WM Recycle America, L.L.C. (“WM”), and its subsidiaries or affiliates to You, the Customer. These Terms and Conditions (“Terms”) are effective as of the date You agree to these Terms or use the Services (“Effective Date”) and govern (a) Your use of the Services, including Your use of the container (the “Container”) in connection with the Services and (b) the relationship between WM and the user of the services and/or Container (“You” or “Customer”). PLEASE REVIEW THE TERMS AND CONDITIONS CAREFULLY. USE OF THE SERVICES CONSTITUTES ACCEPTANCE OF THESE TERMS. THESE TERMS AND CONDITIONS ARE SUBJECT TO CHANGE WITHOUT NOTICE, FROM TIME TO TIME IN WMLT’S SOLE DISCRETION. WMLT WILL NOTIFY YOU OF AMENDMENTS TO THESE TERMS AND CONDITIONS BY POSTING THEM TO THE WMLT WEBSITE (currently: www.wmlamptracker.com). If You have any questions regarding or complying with these Terms, please call WM at 1-800-664-1434 or visit the WM website at www.wmplamptracker.com or www.wm.com. 1. RETURNS. If You do not accept these Terms, You may not use the Container or the Services. However, You may return a Container within ten (10) days (the "Return Period") from the day You received the Container by doing one of the following during the Return Period: (a) return the Container to the place of purchase; or (b) contact Company at the phone number noted above and complete all return instructions. It is a violation of law to ship the Container to, from or through any of the Prohibited States. Company reserves the right to modify the list of Prohibited States at any time. Certain of the Services may be used for multiple pallets of Acceptable Waste (“Pallet Load” or “Bulk Services”) in all fifty of the United States. 3. TITLE TO, AND RISK OF LOSS FOR, CONTAINER AND CONTENTS. Unless and until Company, or its designee, receives and accepts the Container: (a) title to and risk of loss of the Container and its contents shall remain with Customer; and (b) Customer is solely responsible for the contents of the Container. 4. EXPIRATION OF CONTAINER; UNUSED CONTAINERS. Each Container should, within a year of the purchase date, be received by Company or its designee. Neither Company nor its designee has any obligation to accept the Container if not received within a year of the purchase date, even where the carrier identified on a Prepaid Label fails or refuses to ship the Container. Neither Company nor its designee will be obligated to provide Customer a refund for expired, unused Containers. 5. PACKAGING. Customer shall pack and seal the Container in accordance with the instructions included with the Container and any additional instructions that Company may send to the Customer or post on the Company Web Site prior to shipment of the Container by Customer (the "Instructions"). Customer shall pack in the Container only Acceptable Waste, and shall exclude any and all Non-Conforming Waste, as defined below. 6. SHIPPING. Customer shall comply with all Instructions related to shipping. Customer will have received a prepaid return shipping label (the "Prepaid Label") with the Container. The Container may not be shipped from any Prohibited State. Both the Instructions and Prepaid Label(s) may be obtained at www.wm.com or by calling 1-800-664-1434. 7. ADDITIONAL SHIPPING CHARGES. (a) You remain responsible for all Charges of shipping the Container to Company, including, without limitation, increases imposed by the shipper after You have purchased a Prepaid Label. If the shipper identified on the Prepaid Label will not ship the Container, Company's sole obligation will be to refund to You the actual shipping charge received by Company. This obligation is conditioned upon receipt of written request for such refund prior to six (6) months from the date You purchased or received the Container. (b) You remain responsible for all Charges relating to exceeding the weight limits applicable to the Container. If You select a monthly Charge, additional Charges will be applied should weights or frequency of shipments exceed the limitations of Your requested monthly service. (c) You agree to allow Company to charge Your credit card for additional shipping Charges as indicated above, whether or not You select monthly Tracker Services or a one-time purchase of a Container. 8. PAYMENT. Payment terms are net 30 days from invoice date regardless of when the container is filled and returned for recycling. Credit card payments are charged at time of order. 9. ACCEPTABLE WASTE/NON-CONFORMING WASTE/ADDITIONAL CHARGES. Customers should check www.wm.com for updates to this list prior to initiating a shipment of a Container in order to ensure that only Acceptable Waste is shipped in the Container. Materials other than the Acceptable Waste indicated as eligible for shipping in each Container, and material having constituents, characteristics, components or properties not included within the list(s) of Acceptable Waste for each Container shall be "Non-Conforming Waste." (a) Special Terms Applicable to LampTracker Services: Any materials containing polychlorinated biphenyl (“PCB”) shall be considered Non-Conforming Waste. High intensity discharge bulbs qualify as Acceptable Waste only if packaged and labeled in accordance with all federal laws, including United States Department of Transportation regulations or any state law labeling requirements for the purposes of LampTracker Services. (b) Special Terms Applicable to MedWaste Tracker Services: Only Regulated Medical Waste (as defined herein) qualifies as Acceptable Waste for the purposes of MedWaste Tracker Services. "Regulated Medical Waste" includes but is not limited to sharps, gauze, bandages, containers, tubing, blood, blood products, trace chemotherapy waste, tissue, specimens generated in the course of diagnosis and medical treatment or medical waste as defined by Your State medical waste regulations or the OSHA Bloodborne Pathogen Standard (29 CFR 1910.1030). Customer shall, prior to shipping, provide to Company, or its designee, accurate and complete documents, shipping papers or manifests as required for the lawful transfer of the Regulated Medical Waste under all applicable federal, state or local laws. "Non-Conforming Waste" for the purposes of MedWaste Tracker Services means: (1) any waste or other material not falling within the definition of Regulated Medical Waste including complete human remains and abortion products; (2) radioactive waste; (3) any chemical waste and any listed or characteristic hazardous waste; (4) containers that are damaged, leaking or could cause harm or exposure to employees, the general public or others; (5) waste that has been incorrectly identified, labeled and/or segregated; (6) any waste or device containing mercury including amalgam, vacuum pumps and other medical devices; and (7) pharmaceutical waste (except what is accepted under the pharmaceutical disposal program of a Company designee). (c) Special Terms Applicable to AerosolTracker Services: Only certain aerosol cans qualify as Acceptable Waste, and AerosolTracker Services are only available for use by a household or a Conditionally Exempt Small Quantity Generator as certified to Company's reasonable satisfaction ("CESQG"). "Non-Conforming Waste" for the purposes of AerosolTracker Services includes, but is not limited to, those examples of AerosolTracker Services Non-Conforming Waste contained on Exhibit A below. (d) Special Terms Applicable to DentalTracker Services: DentalTracker Services are only available for use by a CESQG, all Acceptable Waste must be disinfected, and no more than net 1lb of elemental mercury may be placed in the Container. (e) Special Terms Applicable to MercuryTracker Services: MercuryTracker Services are only available for use by a CESQG and no more than net 1lb of elemental mercury may be placed in the Container. (f) Terms/Charges Applicable to Non-Conforming Waste: If Company, or its designee, determines that any Container contains Non-Conforming Waste, Company, or its designee, may, at its sole discretion, and at Customer's sole cost and expense: (i) reject the Container and return it to Customer; (ii) return the Non-Conforming Waste to Customer; (iii) treat, process and or dispose of the contents of the Container and/or (iv) report the receipt of such Non-Conforming Waste to the appropriate regulatory or government agency, as required by law. Customer shall be liable for any and all costs associated with Non-Conforming Waste. Neither Company, nor any of its designees, will ever take title to Non-Conforming Waste, and title to Non-Conforming Waste shall always remain with Customer. 10. CHARGES FOR FAILURE TO COMPLY WITH TERMS AND INSTRUCTIONS; CHANGED CONDITIONS; RATE INCREASE; AND ADDITIONAL SERVICES. Company reserves the right to charge or bill Customer additional amounts for any of the following: (a) any Container exceeding its specified maximum weight; (b) shipping materials in the wrong Container, or mixing materials in a Container; (c) additional shipping Charges beyond the amounts prepaid for any Prepaid Label; (d) any costs or expenses incurred by Company as a result of Customer's failure to comply with these Terms or the Instructions, other than the usual and customary costs of Company in the performance of the Tracker Services; or (e) any costs related to changes in applicable law occurring after the date of purchase of the Container. The rates may be adjusted by Company to account for: any increase in disposal or fuel costs; increases or changes in the scope of work, as requested by Customer; increased costs due to uncontrollable circumstances, including, without limitation, changes in local, state or federal laws or regulations, imposition of taxes, fees or surcharges and acts of God such as floods, fires, etc. Company may also increase the charges to reflect increases in the Consumer Price Index. 11. WARRANTY. Each party represents and warrants that it will comply with all applicable laws. Company warrants, except where Tracker Services are used in Prohibited States, as follows: (a) the Container has passed, and meets or exceeds the applicable performance standards of federal, state and local regulations; and (b) if the Container is packed, sealed and shipped strictly in accordance with the Instructions, it is adequate to transport Acceptable Waste to the processing facility from authorized points under ordinary commercial shipping conditions. Other than as expressly warranted herein, the Tracker Services are provided "as is," and Company disclaims any and all warranties, express or implied, including, but not limited to, implied warranties of merchantability and fitness for a particular purpose. Customer warrants that it will not ship any Non-Conforming Waste in the Container and that Customer will otherwise comply with these Terms and all Instructions. 12. INDEMNITY. Provided Customer complies with these Terms and the Instructions, Company will indemnify, defend and save Customer harmless in accordance with the foregoing Terms, except with respect to any matter related to either a carrier collecting or shipping the Container or any Non-Conforming Waste. Customer agrees to indemnify, defend and save Company harmless from and against any and all liability which Company may be responsible for or pay out as a result of bodily injuries (including death), property damage, or any violation or alleged violation of law to the extent caused by Customer’s breach of these Terms or by any negligent act, negligent omission or willful misconduct of the Customer or its employees, agents or contractors in the performance of these Terms or Customer’s use, operation or possession of any equipment furnished by Company, or any occurrences related to Non-Conforming Waste. Neither party shall be liable to the other for special, consequential incidental or punitive damages arising out of the performance of the Terms. This Section will survive any termination of the parties' relationship. 13. EXHIBIT A - Examples of AerosolTracker Services Non-Conforming Wastes (1) Aerosols that are not in good condition (e.g., damaged, corroded, punctured, leaking, or crushed); (2) Aerosols with labels that are missing, covered, illegible, or obscured; (3) Aerosols with a capacity of greater than 1 liter (1000 ml); (4) Products that are not true aerosols (i.e., non-refillable cylinders containing a gas under pressure, used solely to expel a liquid, paste, or powder from the cylinder through a self-closing release device). Examples of prohibited non-aerosols include: • Pump sprays; • Oxygen canisters; • Signal horns; • Non-pressurized self-defense sprays; • Liquefied petroleum gas ("LPG") cylinders; • Gas for powering toy pellet guns; • Other cylinders containing gases only; (5) Aerosols that are specially regulated or not authorized for receipt, including: • CFC-containing products (e.g., certain inhalers and refrigerants); • Expanding foam products (e.g., insulation foam); • PCB-containing products (e.g., certain paints, pesticides, or adhesives that are greater than 25 years old); • Pepper sprays; • Pesticides/herbicides that are not intended for household use or that have labels which do not authorize recycling of used aerosol cans; • Silicone gasket-maker products; • Tear gas cartridges or devices; • Zinc-based paints/primers/coatings (e.g., zinc-rich cold galvanizing sprays); (6) Industrial or other aerosols that do not have potential consumer uses; (7) Aerosols that do not have tops, caps, or lids that are capable of preventing accidental discharge during transport and related handling (e.g., aerosols designed with a removable cap if the cap is missing); (8) Aerosols that are discarded by facilities in any of the following industries: (a) petroleum refining, (b) chemical manufacturing, (c) coke by-product recovery, or (d) treatment, storage, or disposal facilities handling benzene wastes from any of these three industries. Customers should check the Web Site for updates to this list prior to initiating a shipment of a Container in order to ensure that no Non-Conforming Wastes are shipped in the Container. 14. ENTIRE AGREEMENT. This Agreement constitutes the sole and entire agreement of the parties to this Agreement with respect to the subject matter contained herein and supersedes all prior and contemporaneous understandings, agreements, representations and warranties, both written and oral, with respect to such subject matter. If any provision in this Agreement is determined to be illegal, invalid or unenforceable, the remainder of this Agreement will nonetheless survive and govern the rights and obligations of the parties hereto. No provision of this Agreement will be deemed waived, amended, or modified by either party unless such waiver, amendment, or modification is in writing signed by the party against whom enforcement is sought. Any additional or different terms or conditions contained in any document furnished by Customer are hereby objected to and rejected by WM.